A few weeks ago, Mitch Prensky, the Chef-Owner of Supper Restaurant (@supperphilly) tweeted out some interested news. Supper, which happens to be one of my favorite restaurants, was planning on having a New Year’s Day “Hair o’the Dog” Brunch. What is so interesting about that, one may ask. Well, he and his wife, Jennifer, were holding the brunch as a fundraiser for PAWS Animal Rescue…and we could bring our dog!!! 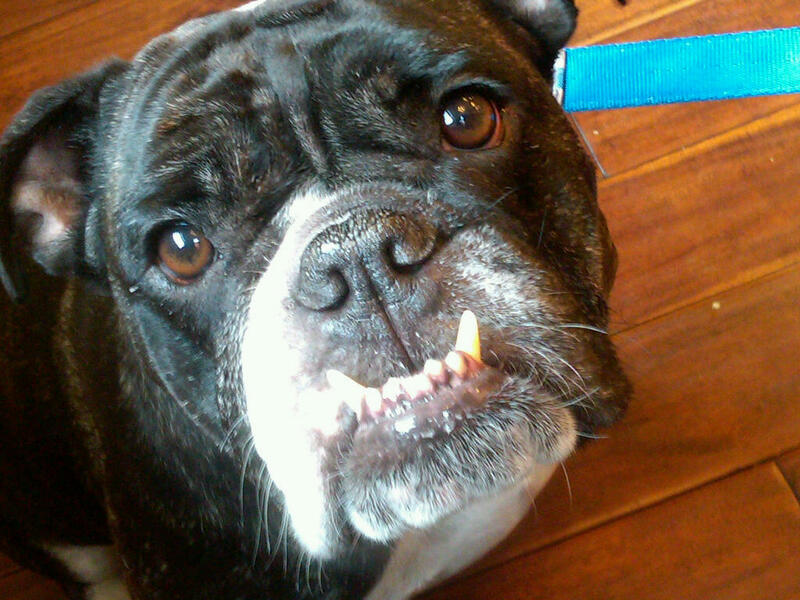 Now, if I haven’t mentioned it before, my husband and I have a four-year old English bulldog named Jewels and she is the light of our lives. We rescued her from HeavenSent Bulldog Rescue, an amazing, volunteer-run, breed-specific rescue, and are big advocates of pet adoption/rescue. We love going to brunch during the warmer months because we can sit outside with Jewels and have a leisurely meal. 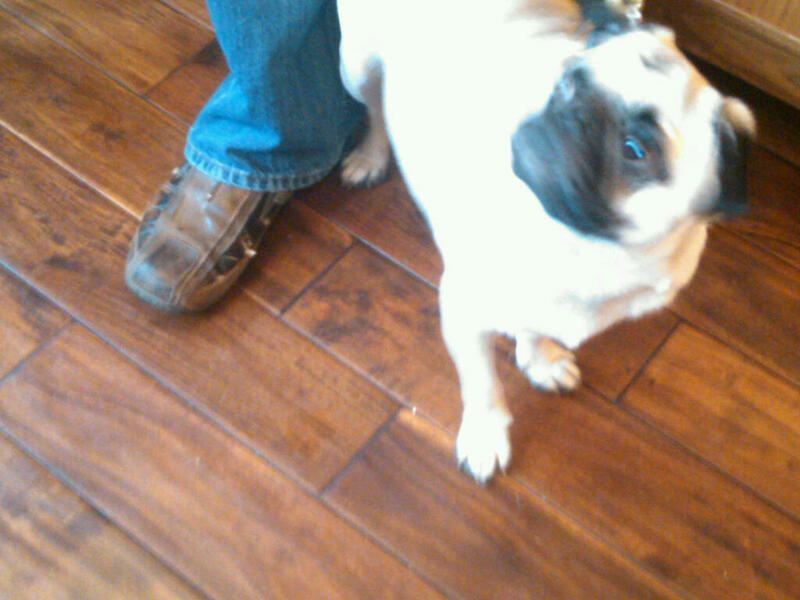 Somehow, winter brunch isn’t quite as fun without our little bulldog so we were SUPER excited at the opportunity. Brunch with Jewels AND an awesome meal??? Yes, please! We woke up late on New Year’s Day and headed up to 9th & South ready for a tasty meal. We found a parking spot right away (this is a big deal!) and made sure Jewels peed before we entered the restaurant because we didn’t want to be “those people” whose dog peed in the middle of Supper. When we got to the door, we were greeted with this sign. Once we entered the restaurant there were fresh cloth napkins for paw cleaning. 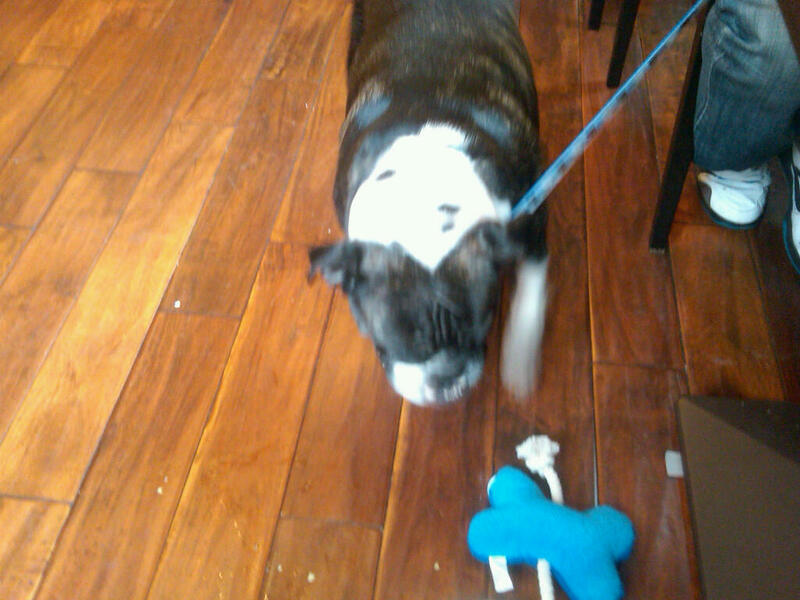 After a quick wipe down, we walked up to the hostess stand and were greeted with overwhelming love and rubs for Jewels. They also gave her a squeaky toy! Jewels was visibly excited about the opportunity to eat inside with us. She obviously knew that something special was going on and relished in the excitement AND extra attention. She tends to be a bit of an attention whore sometimes, but I’m ok with that. We headed over to our seats and perused the menu. 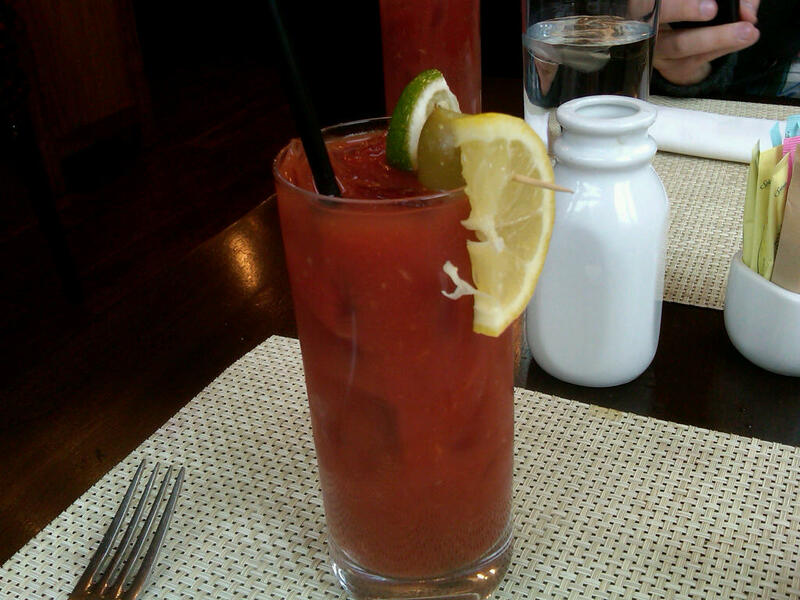 My order went as follows: water, coffee, bloody mary, food. I was torn between the traditional bloody mary and the bloody maria, Supper’s spicier version, but I kept things simple and was pleased with the result. There was still a nice bite and plenty of chewy horseradish. I LOVE horseradish. My husband got something similar with bourbon instead of vodka–he can’t quite recall but remembers that it had Kentucky in the name. On another note, check out the little milk bottle behind my bloody mary–they served the milk for my coffee in that container. Too cute! Even though there were tons of tasty sounding things on the menu, the best post-New Year’s Eve (and pre-parade) meal for us both was the traditional Supper burger. 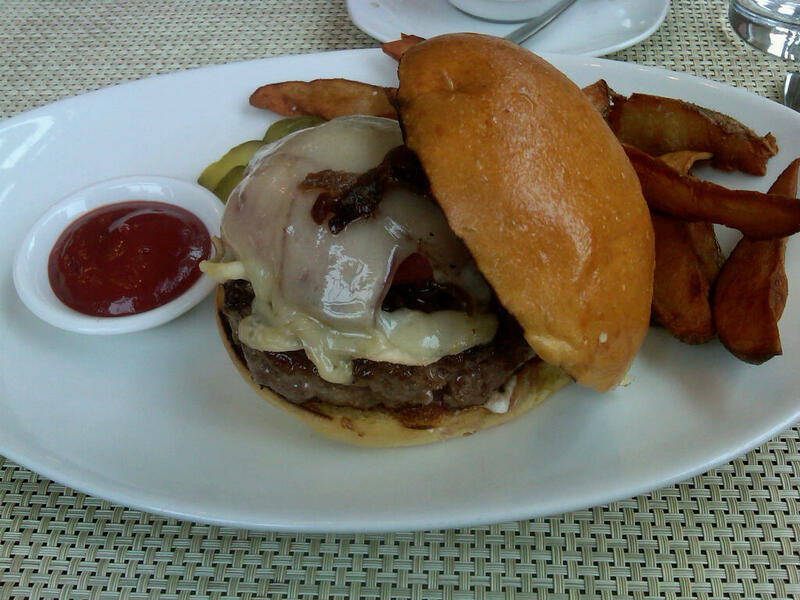 The burger had caramelized onions, smoked bacon, gruyere and roasted tomatoes with a side of duckfat fries and house made pickles. Need I say more? Literally, no words could describe this better than looking at the picture and ingredients. Well, maybe they could, but none of MY words could…Meanwhile, Jewels was playing with her toy and licking her lips after tastes of burger. 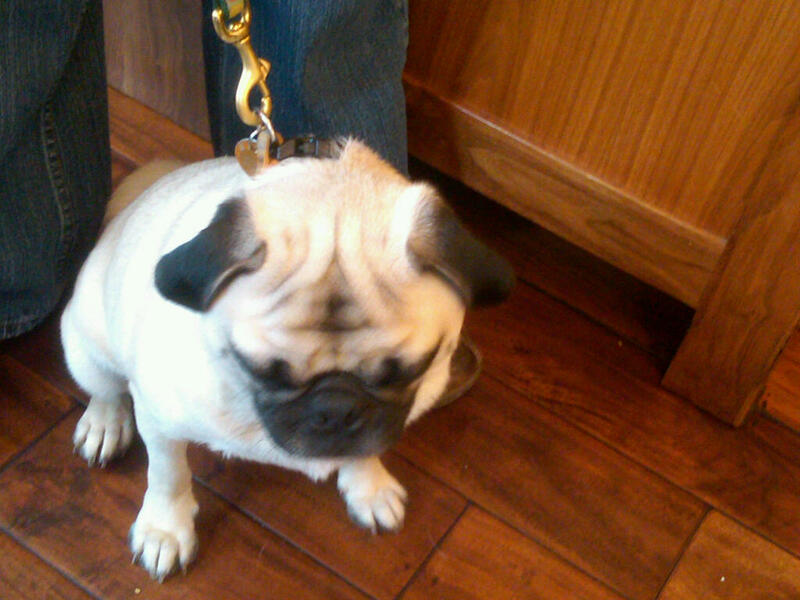 While we were dining, we ran into a Twitter “friend” of mine and her pug, Meatball. Meatball and Jewels sniffed each other a bit, but each of them seemed more interested in the surrounding people–and food, of course. 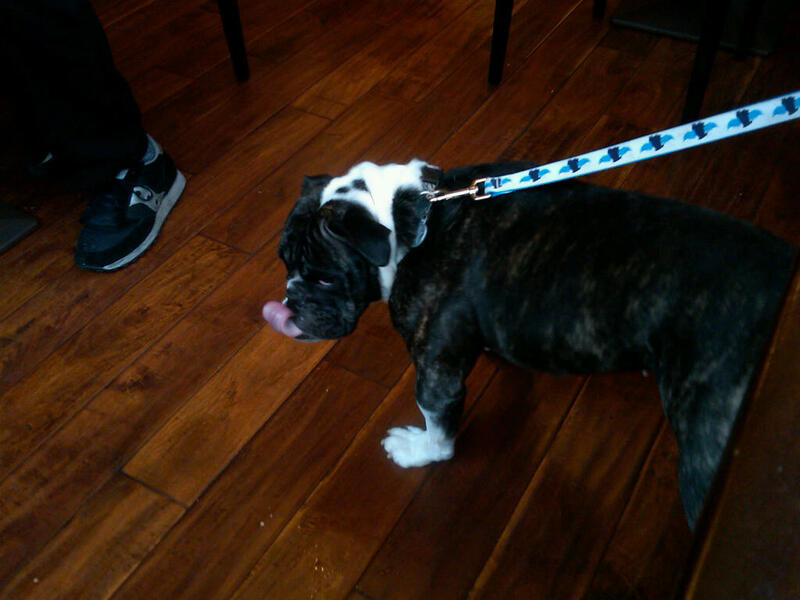 Meatball is a cutie though! It was a successful brunch for all and hopefully Supper was able to give a nice donation to PAWS for all of their hard work and dedication. Thank you to Supper for helping kick off our 2011 with a smile.